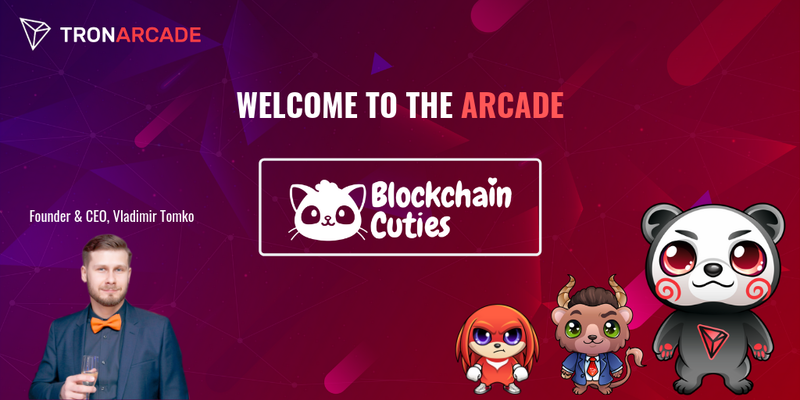 The official launch of Blockchain Cuties on TRON is only a week away, coming upon December 28th! Both founders of Blockchain Cuties, Vladimir Tomko and Andrey Pelipenko, with their entire team have been hard at work launching the first crypto-collectible game on the TRON network. However, not only have they been early supporters of the TRON Arcade initiative, their work has pushed the entire blockchain gaming space forward. The Blockchain Cuties project and team stands out for a number of reasons. But the crown jewel among their list of achievements is being the first Gaming Dapp to achieve interoperability and simultaneous gameplay across multiple blockchains. When Cuties launches on TRON, they will again become the first gaming Dapp to build cross-chain functionality for three different networks. This type of interoperability is the next step for all blockchain games to realize their potential of delivering a new gaming experience. To the Cuties team, congratulations on making history! Arcade has lofty aspirations. We believe gaming can be the mainstream use case which catalyzes the long-awaited mass adoption of blockchain technology as a whole. But that won’t happen without developers innovating tirelessly. They are the lifeblood of the entire blockchain gaming ecosystem. Supporting talented, passionate developers is TRON Arcade’s mission, and our work with the Blockchain Cuties team has only reaffirmed that commitment. Apply to join TRON Arcade here: tronarcade.com. The exclusive Justin Sun Cutie with his pineapple sneakers. The team has made an adorable Cuties version of our mascot Tronbeary (which sold out in a flash to a lucky few) and even a Justin Sun Cutie with his patented pineapple sneakers. Battling an enemy on a Cuties adventure. Cross your fingers for good loot! While Blockchain Cuties is a crypto-collectible game at heart, there are also significant strategic elements. Each Cutie has a unique genome that serves as an analog for human DNA. One part of the metagame is decoding the breeding system to create the most appealing and valuable Cuties. From that point, Cuties go on different adventures, collectively fight against the powerful Raid Boss, celebrate Halloween, Christmas, and pick rare items as awards. As you play, your Cuties will grow in ability and value. Whether you’re a collector, adventurer, or battler there’s a little something for everyone. The official account for TRON's 100 Million USD Blockchain Game Fund.